It seems like yesterday that ‘one of our own’ passed away. 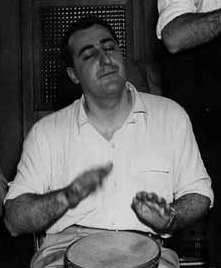 I am speaking of Roger Krikorian who was a world-class Armenian dumbeg musician from the New England (Boston, MA) area. He died in 2007. I still remember where I was and who called me to give me the very sad news and it still is unbelievable to this day. We lost a musician that was considered an icon in the world of performing Armenian dance music. I don’t know that we all realized how great of an impact his death would have on all of us as musicians and enthusiasts of the music. In speaking to many of the musicians that lived near Roger and observing the number of gigs or types of gigs …I can see the impact. To me, Roger was a quiet man but always with a smile. Never a bad word about anyone. I would see him a few times a year at different events or kef weekends and we played music together only a handful of times over the years. He may have been quiet, but when he took to the stage, his percussion playing and singing was a force that immediately brought out the dancers. 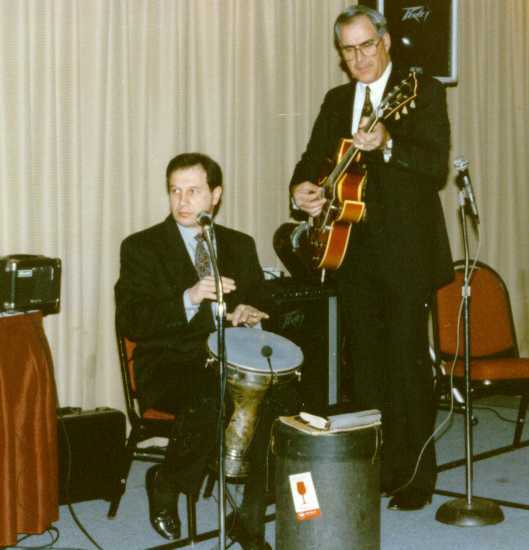 Roger was playing music practically every weekend with either his local group/friends Leon, Kenny, and Joe or traveling throughout the country performing with the likes of Onnik Dinkjian, John Berberian, Richard Hagopian and Hachig Kazarian. As I understand it, at a young age Roger’s father took him to Gary Alexanian for dumbeg lessons. After listening to Roger play in front of Gary – he tells Roger’s father that lessons were not necessary – he was a natural. So, Roger, like most Armenian dance musicians, would listen to records and play along with them to learn the songs and rhythms. When Roger was nine years old, he got his first chance to play live in front of an audience with another great musician, Buddy Sarkissian. So much can be said about him, but the best way to describe Roger is by listening to him play music. As a bit of audiophile junkie, I would record many of the live performances whenever I would travel to the East coast to hear live music. For me, it was one of the rare opportunities to hear some of the musicians I grew up listing to on recordings. Many of those recordings feature Roger’s drumming and singing. When I list to these recordings, it doesn’t feel like we have lost Roger and as I said earlier – its like it was yesterday. Fortunately, YouTube and a handful of archivists, have included many clips from Roger’s various performances. Here is one of them. Roger’s brother recently made available a double CD set of some of Roger’s finest performances of Armenian, Greek and Arabic music. This tribute from his brother is very touching and was not done for financial gain but for those of us that love Armenian music and enjoyed the talents of Roger – it is a way to remember him. Tom Vartabedian, a columnist for the Armenian Weekly wrote a touching tribute about Roger that is featured in the CD packaging. The CD set features over two hours of music featuring many of the performers Roger frequently work with including Mal Barsamian, Leon Janikian, John Berberian, Bruce Gigarjian, Ken Kalajian and much more. The CD set can be found by contacting the Armenian Weekly and if you live in Detroit, please contact St. Sarkis Armenian Apostolic Church or St. John’s Armenian Church for additional information. All proceeds will benefit the entity that sells you the CD set. This entry was posted in Uncategorized and tagged Arabic, Armenian, Armenian Weekly, Buddy Sarkissian, CD, church, dance, dumbeg, Gary Alexanian, Greek, Hachig Kazarian, John Berberian, Massachusetts, music, musician, New England, Onnik DInkjian, Richard Hagopian, Roger Krikorian, Singing, St Johns, St. Sarkis. Bookmark the permalink.